For more than a year, the Trump administration and China have imposed tariffs on each other's goods. And trade tensions are high between the U.S. and Europe. So where does that leave a Chinese-owned Swedish company building cars in South Carolina? It's all about adapting, as NPR's Camilla Domonoske reports. CAMILLA DOMONOSKE, BYLINE: The port in Charleston, S.C., has been a shipping hub for hundreds of years. JIM NEWSOME: Probably proportionally, South Carolina as a state is more dependent on global trade than any other state in the country. DOMONOSKE: Jim Newsome is the CEO of the South Carolina Ports Authority. He's run the port for nearly 10 years. He's a big believer in free trade. NEWSOME: We ought to be trying to lower tariffs, you know, not raise tariffs. I think the world would be - global automotive industry could benefit from zero tariffs. 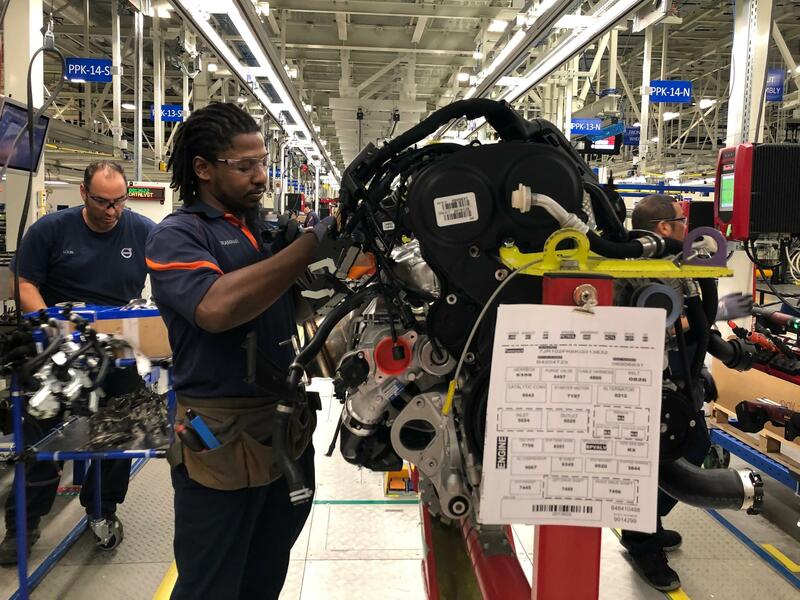 DOMONOSKE: BMW, Mercedes Benz and Volvo all have plants in South Carolina, employing thousands of people. Volvo's is brand new. It opened near the small town of Ridgeville last year. Volvo Cars is a Swedish company. It's owned by a Chinese firm, Geely. And a batch of cars made at this South Carolina factory was recently exported to Belgium. That was a quick shift after tariffs threw a wrench in Volvo's finely tuned plans. TREMAINE SMALLS: And we'll be locked and loaded and ready to go. DOMONOSKE: Tremaine Smalls has been working for Volvo for about 10 months. He's from Orangeburg, 40 miles up the interstate. Right now he's putting bypass tubes and drive shafts onto engines. SMALLS: They've got part numbers on them - 0321. You want to make sure you verify your part number. DOMONOSKE: These are the kind of American manufacturing jobs that protectionists want to, well, protect. But modern cars are built thanks to a global supply chain. These engines Smalls is working on, they were manufactured in Sweden. Each luxury sedan that rolls off this line is made of thousands of parts from around the world. So tariffs on imported parts can hurt auto manufacturers in the U.S. But tariffs also hurt companies that make those parts, including American suppliers. Christine McDaniel is a research fellow at the libertarian Mercatus Center. She points to companies in South Carolina that manufacture car components. CHRISTINE MCDANIEL: But to make those auto parts, they import steel and aluminum. DOMONOSKE: Tariffs on those raw materials have squeezed those suppliers, and there's a lot at stake. MCDANIEL: And in fact, there's more jobs in the supply chain than in the assembly line. DOMONOSKE: Half the cars made at this plant are destined for export. And the original plan was to send cars to China. Then the trade war started. And after the U.S. put tariffs on Chinese goods, China retaliated with tariffs on U.S.-made products, including these cars. TREY YONCE: Unfortunately, we weren't able to, you know, ship to China, which is - you know, it's kind of a disappointment. But we're going to work through it. DOMONOSKE: Trey Yonce is the supervisor of Volvo's power pack line. He's a Charleston native and a former motorcycle racer. YONCE: It wasn't what we wanted to hear, you know, so - but like I said, we're a strong company. This plant's still going to be here. We're going to work through it and find our way, what we need to do. But yeah, it wasn't exciting news. DOMONOSKE: Yonce is right. The tariffs haven't derailed the plant's operations. Instead of exporting to China, Volvo's sending cars to Europe, Australia, Africa and the rest of Asia instead. 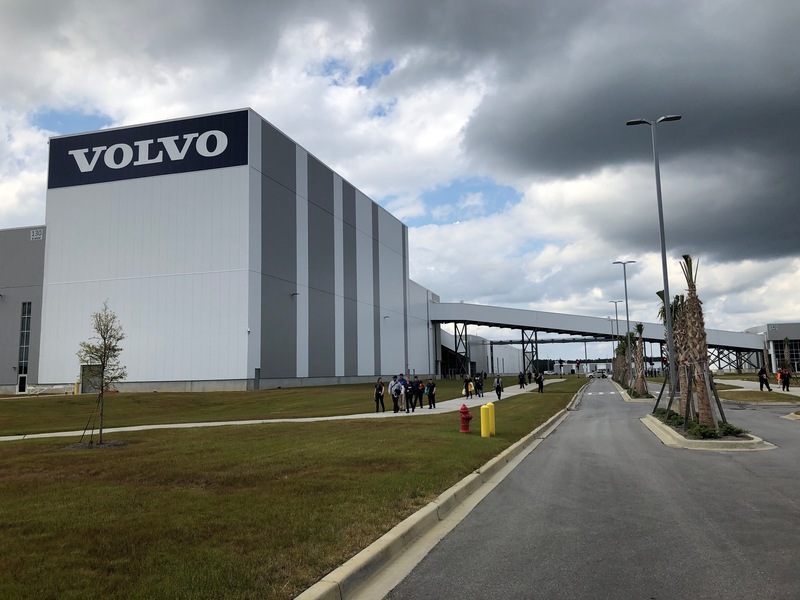 And Volvo is still planning to ramp up production and add an SUV to this plant. Anders Gustafsson is the CEO of Volvo Car USA. He says Volvo has had to move quickly to adapt, but he's taking the long view. ANDERS GUSTAFSSON: To run a plant or run a company, you know, it's a long-term decision. So you lose, and you win. DOMONOSKE: Analysts compare tariffs to squeezing a balloon. Put pressure on one spot, and the global economy will shift. It won't stop altogether. So the delicate dance continues. Car parts keep showing up at a factory in rural South Carolina, and workers keep building cars that roll onto ships and cross the ocean, going somewhere - just not to China, at least for now. Camilla Domonoske, NPR News, Ridgeville, S.C. Transcript provided by NPR, Copyright NPR.